Woodturning News! We have just returned from a logging trip. We bought Ambrosia Maple, Black Walnut and Cherry logs. We are almost sold out of our Ambrosia and hope to be milling more in a few weeks. Check out our popular Norfolk Island pine blanks. Steve made this beautiful closed form which is one of my very favorite pieces. We just finished cutting our very popular Norfolk Island pine. The sizes run from 4" to 15 diameter". The large sizes sell out quickly. Cadaghi Eucalyptus is now on our site. This is the first time that we've had this wood. Unfortunately, we only have the small amount that are shown on the site and no more logs of it. It's a great turning wood! 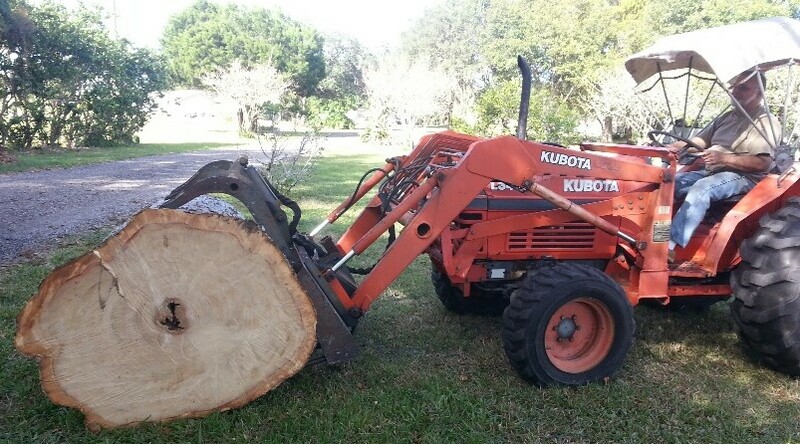 A developer was clearing a large tract of land with many Camphor trees on it. The tree shown above is large but not the largest on the property. The largest one measured 27 feet around! Sad to see so many beautiful trees being cut down and chipped up. Luckily for us, we were able to get a couple loads before they hit the chipper. 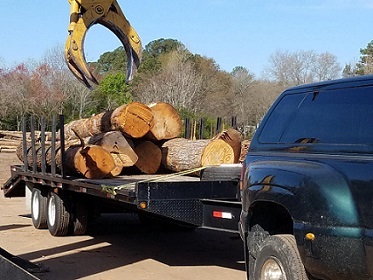 Since we were able to get a good deal on these logs, we have passed on the lower prices to you. 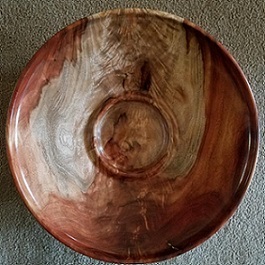 This is a beautiful figured Camphor chip and dip platter that Steve just finished. We have put our 4x2, 4x3 and 4x4 Indian Rosewood on sale due to overstock. Take advantage while supplies last. 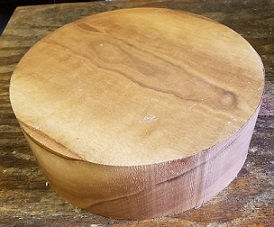 Also on sale are 2x2x10, 2x2x12 and 2x2x14 Cherry spindle blanks. Now available, tall blanks of Cherry, Eastern Red Cedar and Indian Rosewood. We have Tipuana Tipu, which is a member of the Rosewood family. It turns easily and is a stable wood. 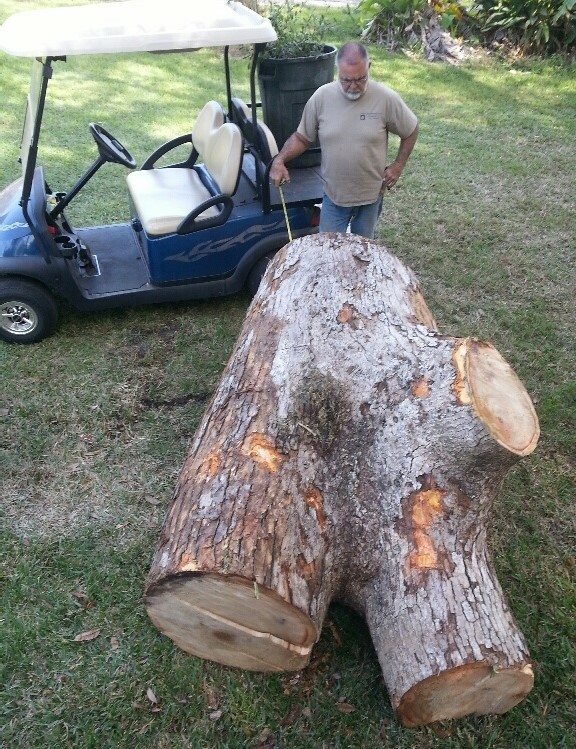 Camphor logs, so large and heavy that the tractor didn't want to pick them up! Steve is pondering the best way to cut this crotch piece; hoping for some nicely figured wood. We are carrying some favorite woodturning supplies: Pentacryl Wood Stabilizer End Grain Sealer and Odies Butter. 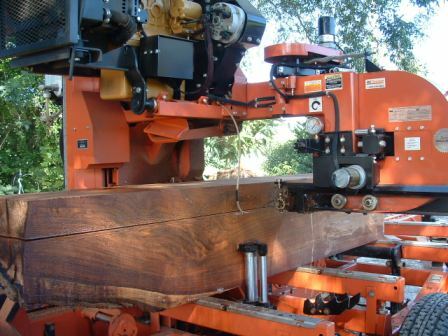 A Rosewood log is pictured above during the milling. 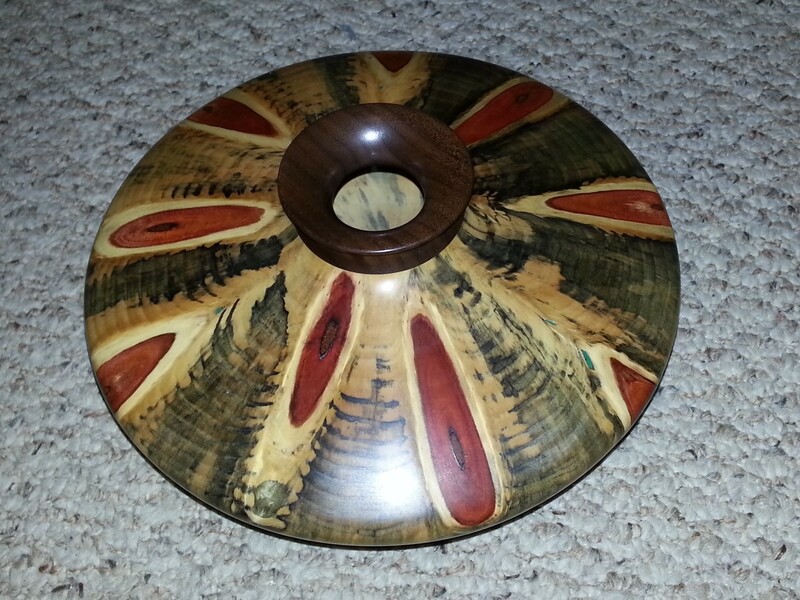 Return from Woodturning News to our Woodturning Blanks 4 U home page.